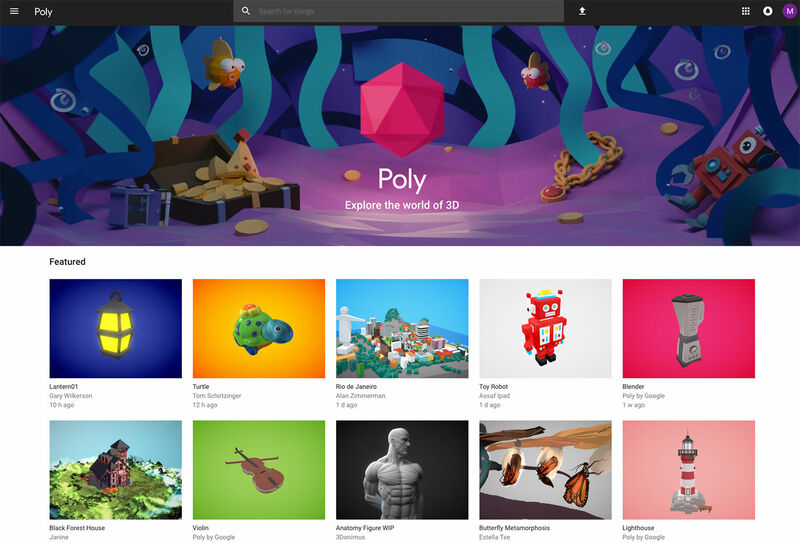 Google can now add 3D assets provider to its list of services, as it announced a new platform called Poly last night (UK time) much to the delight of VR and AR developers. Poly is a platform where anyone can browse and download free 3D objects and scenes. Google created Poly specifically with VR and AR apps in mind, such as its own Tilt Brush and Blocks (Poly is fully integrated with both of these). However, the objects are all in OBJ format, so can be downloaded in applications from Cinema 4D and Maya to Adobe's new Dimension software (neé Project Felix). Google hopes Poly will make it easier to create and develop in 3D, according to Google’s blog post published last night. You can search thousands of free models to use in your VR and AR apps – everything from a robot or ice-cream cone to entire ‘Alien World’ or ‘Winter Island’. Users can create a profile to keep track of uploads or "likes", and can sift through helpful categories such as animals & creatures, architecture, places & scenes or technology, to name a few. There’s also an option to 'remix' or manipulate many of the models you find too, so if a robot needs more arms, you can add some in. Click like to import a remixable object into Tilt Brush or Blocks and make changes; Poly will automatically credit and link to the original creation when you publish your remix. Poly allows direct OBJ file upload, so whether you’re creating "an intense space walk in VR, or a serene garden of AR flowers, you’ll find the ingredients you need", Google says. Google suggests Poly for developers building for VR, Google's ARCore or Apple’s new ARKit. But don’t assume Poly is only for developers – anyone can use Poly to view 3D objects in a mobile or desktop browser, and once you find something you like, you can create a GIF and share it, or view it in other VR applications. Google’s Poly announcement follows Adobe also releasing 3D assets to Adobe Stock this year, as well as 3D editing software Dimension, announced at Adobe Max. For more websites where you can download 3D assets, see our 5 best websites (paid) for 3D assets or our 7 best websites for free 3D models.